You’ve done everything right. You cleared out those beds at the end of last summer, pruned and cut back those sturdy perennials, laid down a layer of protective mulch and leaves, and now…. Nothing. What! By the very definition of their name, perennials should come back year after year. But this year some of your favorites never returned. Why? 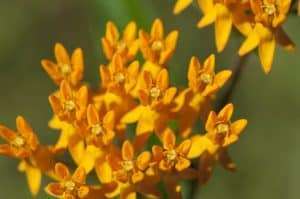 Many factors influence the reliable return or the final farewell of perennials, depending on each plant’s ability to withstand overly harsh conditions such as draught (Yes, draught happens in winter just as it does in summer. ), insect infestation, late heavy frost, consistently below-normal temperatures for a lengthy period of time, or an unfortunate combination of all of these, as well as many other factors. Consider the age of your bygone perennials; those that have graced your garden for more than five or six years may simply have “died of old age.” If you keep a garden journal, over the years you will be prepared for a plant’s passing and better able to come up with a new garden plan. Were the failed plants in an area of high exposure to harsher-than-normal conditions? While normal conditions may have worked well for a particular variety, extreme weather may have let you know that the area may not be the best place for your chosen plants—so, lesson learned. Time to revise your plan to avoid future disappointment. What we are getting at is that perennial “failure” is a teachable moment, not a disaster. We are always available to consult on why a plant or a part of your garden failed. And that conversation you have with us is valuable, so take notes, ask lots of questions, keep records and avoid an unpleasant empty space in the garden next time. So that’s great for next time…what about NOW. You’d like a nice garden NOW. It’s true, a late, unexpected snow storm or heavy frost can nip tender buds and damage sections of large flowering plants and shrubs, especially if the winter has already been unseasonably cold or dry and the late frost is heavy and lasting. The answer here is most likely to aggressively prune the bush, realizing that it will grow back eventually and the flowers will return. But for now it will be small with green leaves…nothing more. Instead of mourning its diminutive size and lack of bright flowers, fill in the space with something unexpected, bright and fragrant. 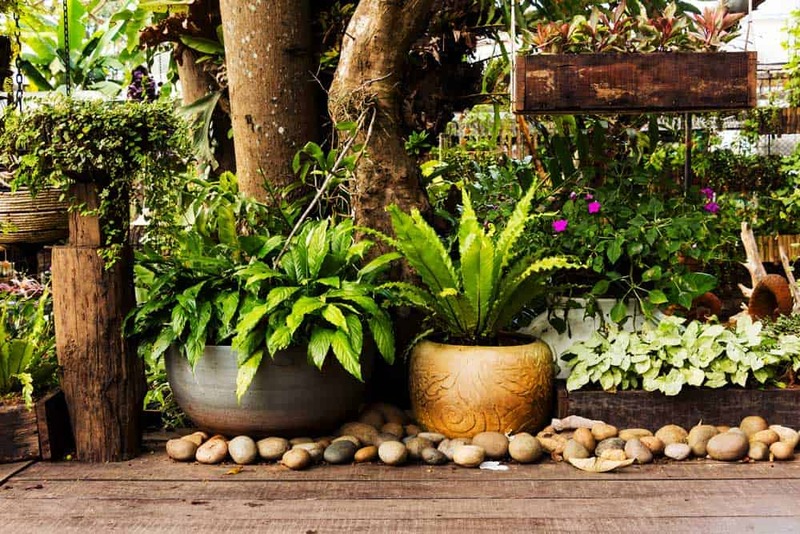 Using your pared-down shrub as a green, textured backdrop, arrange some colorful and interesting pots on their sides (A strawberry pot is ideal for this. ), fill partway with potting soil and allow sedum, hens and chicks, petunias, frilly herbs and other hardy annuals to be the focal point of that space. A shallow, large clay saucer with some pretty river rock will offer birds a welcome drink and add to the interest of this “failed” space. 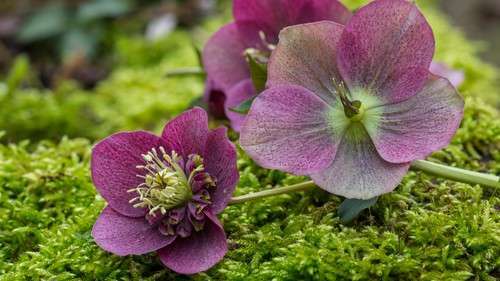 A pink helleborus sits atop moss. Stuff happens… but that’s not helpful, is it? What will help this situation is the inclusion of bright annuals using some unusually creative approaches to design. Try some big coral, white and pink begonias or impatiens in basket-shaped pots on pedestals—just take very large clay pots and turn them upside-down in the “holes” and set the begonias on top. Or, replace the empty spaces with bunches of caladium. You can dig your caladium bulbs up in the fall, dry them out and store them in dry paper sacks until next spring, when you can replant and enjoy them again. Another idea… make a path. Empty space can be filled with more than flowers. If there is accommodating space, what better opportunity to throw down some pretty stones and create a walkway right through that shade garden. You can even plant some tiny ajuga or creeping jenny in between your stones, which will fill itself in over time, and a couple of fairy statues, turning this area from a shade garden to an enchanted one. Perhaps a fresh start isn’t all bad. Maybe it is time to rethink those expensive, high-maintenance plants and switch them out for plants that are stronger, more forgiving and much less expensive. We are talking about native plants—plants designed by nature for the cold winters, draught-plagued seasons, and hot, humid summers of the Midwest. In between those lovely roses that have survived, you might plant sun-loving orange butterfly milkweed, pink coneflowers, or bright multicolored bee balm. These plants have spectacular blooms and grow quickly, especially if you pamper them a bit with some watering. Natives are favorites of bees, butterflies and hummingbirds. Your garden will not only gain back its dramatic flair but also serve as a vital food source for endangered wildlife. Even though you will still need to treat your remaining roses with lots of TLC, these hardy natives will take care of themselves with little fuss. They spread naturally, so a few now will mean more down the road, without your intervention. No, this rose garden will not look the same, but it will look spectacular. Add a birdbath and a lawn chair so you can watch the show of colorful fluttering wings and wind-tossed wildflowers. So, the last word in poop-out perennials is not “failure.” The last word is opportunity—the next steps you’ll take to keep you garden welcoming and beautiful not matter what happens.